Innovative 5 x 100kW modular UPS system offering pay-as-you-grow scalability combined with 99.9999% ‘six nines’ availability. Built for IT environments that demand zero downtime and future-proof power protection. Listed on the Carbon Trust’s Energy Technology List for Enhanced Capital Allowances (ECA). This UPS also features Xtra VFI mode: maximum efficiency even when under loaded. PowerWAVE 9500DPA boasts the lowest total cost of ownership in its class through a combination of high energy efficiency, scalability and ergonomic design. A class-leading online energy efficiency of up to 96% significantly reduces system running and cooling costs, helping to reduce the organisation’s carbon footprint. Further energy savings can be made by operating the PowerWAVE 9500DPA in Eco-mode, which increases the efficiency to > 99%. The UPS can be ‘right-sized’ to optimise the power required to match the critical load and modules can be added incrementally as the load increases. This means that you only power and cool what you need, saving power usage over the life of the UPS. Additionally, PowerWAVE 9500DPA has a near unity input power factor at full load reducing the size of the input cable and fuses, thereby saving on materials and costs. Input current total harmonic distortion (THDi) of less than 3.5% virtually eliminates harmonic pollution on the mains supply. This saves unnecessary over-sizing of gen-sets, cabling and circuit breakers, avoids extra heating of input transformers and extends the overall lifetime of all input components. True ‘hot-swap’ modularity enables the safe removal and/or insertion of UPS modules into a PowerWAVE 9500DPA system without risk to the critical load and without the need to either transfer the critical load onto raw mains or remove power from the critical load. With an online energy efficiency of up to 96% and ≥ 99% in eco-mode, this is one of the most efficient uninterrupted power supplies on the market with an extremely low carbon footprint. The PowerWAVE 9500DPA features Xtra VFI mode – a smart way to minimize losses and improve efficiency when running in double conversion mode. With Xtra VFI mode enabled, the UPS automatically adjusts the number of active modules according to the load requirements. Modules that are not needed are switched to standby but remain in a state of readiness, primed to kick in and transfer to active mode if the load increases or the mains fails. The efficiency improvements are essentially significant when the load is less than 25% of full capacity. Find out more and see an example. The PowerWAVE 9500DPA offers an exceptionally low cost of ownership with its inclusion on the Carbon Trust’s Energy Technology List for Enhanced Capital Allowances (ECA). This means businesses are able to offset the total cost of the equipment against taxable profits within the year of purchase. 100kW modules can be added and removed with no risk to the critical load and no downtime. A truly future-proof UPS system offering horizontal and vertical growth to a maximum of 3mW. Advanced decentralised parallel architecture and parallel redundancy provide ‘six nines’ availability with no single points of failure even during UPS maintenance. Decentralised Parallel Architecture (DPA) means each UPS module contains the hardware and software required for full system operation. They share no common components so a DPA parallel system offers extremely high availability. In addition, potential single points of failure are eliminated and system uptime is maximised. UPS modules can be paralleled to provide redundancy (parallel redundancy) or to increase the system’s total capacity. Intuitive 7” colour display provides instant monitoring with a clear overview of performance at a system and modular level. Energy storage for UPS systems. 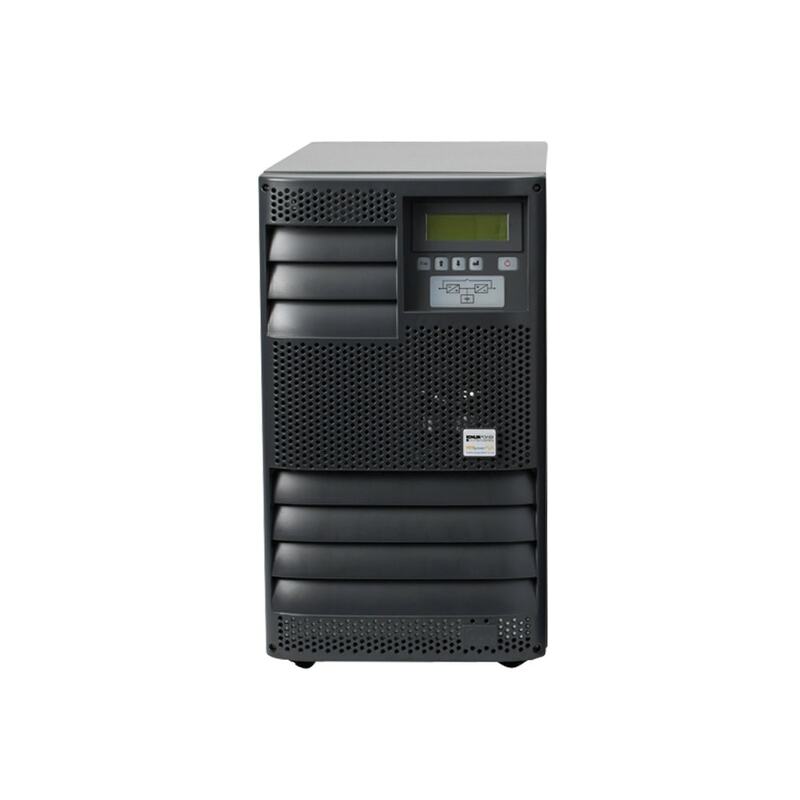 UPS systems such as the PowerWAVE 9000DPA Series are configured by plugging up to five modules into a 19” rack to meet the capacity and redundancy requirement of the application load. This provides more flexibility and scalability than a complete cabinet containing a single standalone system.